DVD Region 0 (all regions) PCM audio. 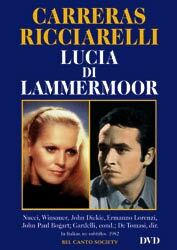 Ricciarelli is a harmonically sensitive Lucia who makes drama out of “Regnava nel silenzio,” feeling every word. She uses a heavier, more forceful sound in Act II, acts well and interpolates a D-flat at the end of the sextet. Carreras feels the part of Edgardo, is in fresh voice and has a good breath span. He’s impassioned in the “Maledetto” section of Act II and sings the opera’s final moments with pathos. Nucci imbues Enrico with great emotional intensity, also a precision of rhythm from which the music benefits. He feels “Cruda funesta smania” in his guts–and gives a spinal chill. His is the most viscerally satisfying account of the aria I’ve heard. Both face and voice ooze disdain.